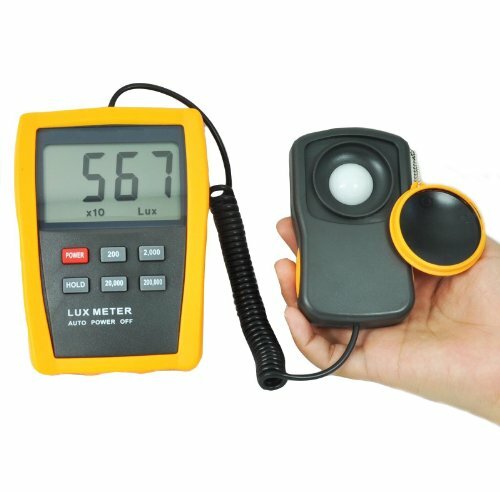 This is a professional light meter model LX803 that can be used by nurseries, general hydroponics growing, hobby orchid growers, or for everybody who installs lights or needs to check and audit light levels in buildings. And it also has a high upper range, up to 200,000 lux, therefore it can measure intense bright light, such as metal halide lights and power LED lights, which frequently used in hydroponic growing, and also direct sunlight. This light meter is used to adjust plant growing lamps. For growing plants the measurement should be taken near the pot. This electronic light meter LX803 also works well with incandescent and fluorescent lamps. Architects, electricians and lighting consultants use this digital meter to test light levels in buildings, offices, work shops and production areas. When the lighting is set correctly significant cost savings can be achieved. View More In Light Meters & Accessories. If you have any questions about this product by www.meter-depot.com, contact us by completing and submitting the form below. If you are looking for a specif part number, please include it with your message.